In training with Invictus athletes Jump to media player The BBC's Disability Affairs Correspondent Nikki Fox meets two of the competitors in the Invictus Games as they train for their events. UK squad prepares for Invictus Games Jump to media player A British Armed Forces team is preparing for the first ever Invictus Games - a series of para-sport events for wounded, injured and sick service personnel. Invictus Games UK squad announced Jump to media player The squad for the inaugural Invictus games is announced as Prince Harry, who helped set it up, meets members of the UK squad. Harry wants to get wounded working Jump to media player The first ever Invictus Games, a series of para-sport events for wounded, injured and sick servicemen and women, begin in September. Harry launches injured soldier games Jump to media player Prince Harry has officially launched a Paralympic-style sporting championship for injured military personnel. Harry starts off US Warrior Games Jump to media player Prince Harry has started the first event of the Warrior Games for injured service personnel, being held in Colorado, US. Prince Harry wants UK Warrior Games Jump to media player Prince Harry has said he hopes to bring America's Warrior Games for injured servicemen and women to the UK. Hundreds of injured servicemen and women from around the world are in London for the first Invictus Games, the brainchild of Prince Harry. Some of the competitors have lost limbs, or suffered long term injuries. Others are struggling with the mental scars of the conflicts they have experienced. 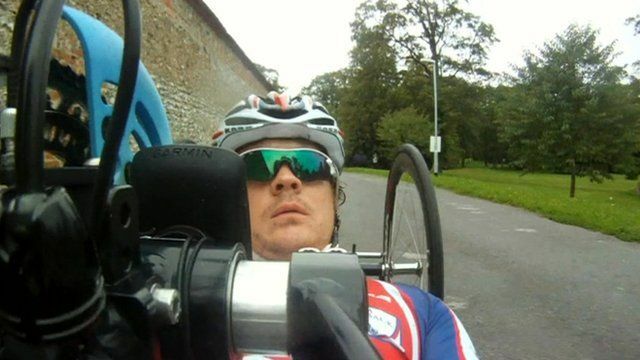 The BBC's Disability Affairs Correspondent Nikki Fox went to meet two of them as they prepared for the competition.